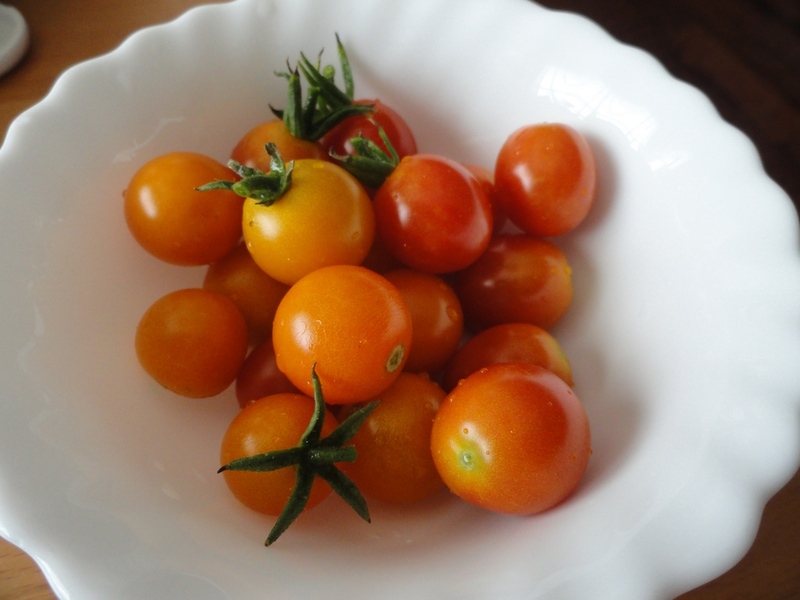 Growing a garden from seed can produce tasty rewards, like these juicy and sweet Sun Gold cherry tomatoes! As one of the co-owners of the Southern Exposure Seed Exchange (SESE) co-op, Ira Wallace is extremely knowledgeable about seeds, particularly when it comes to the edible plants that predominate in the SESE catalog. As Ira's biography details, she has had a wealth of experiences from her early days volunteering at Florida's Sarasota Succulent Society, to her learning experiences on a kibbutz in Israel, an organic farm in Denmark and a cooperative community in Canada where she became a certified plantsman. In addition to her work at SESE, Ira serves on the board of the Organic Seed Alliance, writes for Mother Earth News and helps organize the Heritage Harvest Festival at Monticello (September 14-15 this year). GardenofAaron.com: Your website says that you carry more than 700 varieties of vegetable, flower, herb, grain and cover crop seeds. Are all these seeds organic and how do you choose which varieties to carry? Ira Wallace: Over 400 of our varieties are USDA certified organic and many of the remaining varieties are grown sustainably by small part-time farmers and gardeners committed to seed saving and preserving heirloom varieties. We work to help more seed growers get certified organic and to help more certified organic farmers add seed production to the mix produced on their farm. We trial all of our varieties on our farm here in Central Virginia. Many of them are family heirlooms sent to us by customers like Shronces' Deep Black peanuts or varieties developed by southern universities or extension stations like Tropic tomato from Florida or the nematode resistant Carolina Wonder pepper. We also like to offer the fruit of successful on-farm and amateur breeding programs like the Cross Continental Breeding program that Craig LeHoullier and many others are working on. Brett Grosghal at Ev'nStar Farm has given us some great Winter Hardy Greens. Frank Morton at Wild Garden Seeds does amazing work with lettuce. Folks love his Wild Garden lettuce mix. The USDA gene bank has been really helpful for getting seed samples of older varieties no longer available commercially to try. From those and other sources we offer the best from our trials in the Southern Exposure catalog. GardenofAaron.com: Is it too late to plant some additional garden crops in the Southeast? Ira Wallace: Actually, this is a great time to plant crops. You can still plant summer crops like summer squash, cucumbers and zucchini, but you would want to plant a variety that matures quickly, like Yellow Crookneck squash (55 days to maturity) or Spacemaster cucumber (60 DTM). GardenofAaron.com: How about planting fall crops? Ira Wallace: It can be hard for organic gardeners to get seedlings started in the middle of summer, particularly due to pressure from insects. I like to cover the seedlings with a floating reemay cover. Of course, it doesn't look pretty, but that's why I group all my seedlings into a dedicated bed where I can keep them watered and protected with the reemay. Then when the temperatures cool down and the plants are more established, I transplant them throughout the garden. As the weather cools, these crops grow fantastically well with little pressure from insect pests that are less active in the colder weather. I always get much larger, nicer heads of broccoli and cauliflower in the fall than I do in the spring.Other seeds to sow in a rich bed with afternoon shade from tall crops like corn or staked tomatoes and beans are cilantro, cabbage, broccoli, collards, salad greens, Chinese cabbage, Asian greens, beets and carrots. Wait until it is cooler in late August or September for arugula, kale, spinach and lettuce. I use the seedling bed covered with floating row cover for many types of seedlings, except root crops which are better sown in place because they do not transplant well. GardenofAaron.com: What about waiting until the weather cools - here that could mean into October - to plant fall/winter crops? Ira Wallace: The problem with waiting that long is that the plants really won't grow much during the winter. But if you plant something like Bloomsdale Spinach, it should overwinter well in the South, especially if it is well-mulched, and then grow really well in the springtime as the weather warms up. Bloomsdale is a particularly good variety for over-wintering since it grows low to the ground, which affords it better protection from hard freezes versus the types of spinach that grow more vertically. On the other hand, autumn is the time to plant crops like garlic and onions that you would then harvest the following May or June. GardenofAaron.com: Speaking about mulch, what sort of mulch do you like to use in your garden? Ira Wallace: I like to use straw, particularly because it has few weed seeds. We also use hay sometimes. As for wood chips, we use those mostly on the paths between the beds. GardenofAaron.com: And then do you turn in the straw to act as a soil ammendment? Ira Wallace: We do! We like to add as much organic material to the soil as possible. We turn in the straw and we also grow cover crops like buckwheat that we turn into the soil. Here in Virginia, those beds where we have gardened for a number of years have been transformed from red clay soil into brown gold. GardenofAaron.com: How about fertilizer? Do you use any type of fertilizer in particular in your gardens? Ira Wallace: We used to use a lot of chicken manure, but then we realized that we were raising the level of phosphorus quite a bit, so we don't really use much of that anymore. Mostly nowadays we just use amendments like earthworm castings or mushroom compost that we can get from an organic mushroom growers. I would encourage gardeners to see if they can find interesting and unusual fertilizer sources nearby. For example, one of my gardening friends is able to get okara, which is a byproduct of tofu production. Okara is naturally high in nitrogen and can make a great soil amendment to an organic garden. GardenofAaron.com: Are there any particularly interesting or unusual varieties of seed in your catalog that you think gardeners might find exciting? Ira Wallace: We have these really neat seeds from a plant called an Egyptian Walking Onion. These are perennial onions that are quite hardy to zone 4. You can eat the green stalks anytime and dig the onion bulbs themselves in fall and winter, using what you want and replanting the rest. But you actually don't even have to dig the bulbs at all, because the stalks themselves produce aerial bulblets! GardenofAaron.com: Thanks for your time and your advice, Ira! We hope you'll participate in an interview again in the future! Ira Wallace has generously offered to have Southern Exposure Seed Exchange be our first GardenofAaron.com sweepstakes sponsor. One lucky winner will receive Five (5) Seed Packets of his or her choice from among those seed packets priced at $4 or less in the Southern Exposure Seed Exchange catalog. This covers most of the 'regular' size seed packets in the catalog, which is one of the most exciting and diverse mail-order catalogs that I have seen. The SESE seed catalog includes vegetables, flowers and herbs, many of them unusual heirloom varieties you may not find elsewhere. To be eligible to win, all you need to do is subscribe to the GardenofAaron.com email list and post a comment below saying what (if anything) you are hoping or planning to plant this autumn. Update 8/2/2012 - When you sign up for an email subscription, FeedBurner (which manages the email list) will send you a verification request. You must verify your email and activate your subscription by 8/7/2012 at 11:59 p.m. Central time to be eligible to win the sweepstakes. - No purchase necessary to enter. A purchase or payment of any kind will not increase your chances of winning. - Winner can choose any five available seed packets in the Southern Exposure Seed Exchange catalog with a listed retail price of $4 or less each. - Prize includes shipping and handling from Southern Exposure Seed Exchange to winner's mailing address in the contiguous United States. - Total maximum approximate retail value of this prize is $25, although prize value may be lower depending on seed packets chosen by the winner. - This sweepstakes began on Wednesday, August 1, 2012. The contest will run for one week. To be eligible to win, you must have signed up for the email list and posted a comment by 11:59 p.m. U.S. Central time on Tuesday, August 7, 2012. - On Wednesday, August 8, 2012, GardenofAaron.com will choose one (1) winner from among the eligible entries by using a random number generator website. The number of eligible entries received determines the odds of winning. Winner will be notified by email (if the commentator's profile contains an email address) or via a posting on GardenofAaron.com (if the commentator's profile does not contain an email address). Winner will have 72 hours from the time of being contacted by email and/or GardenofAaron.com blog posting to respond and confirm acceptance of prize. - To receive the prize, winner must agree to allow GardenofAaron.com to identify his/her comment as the winning comment. - To receive the prize, winner must also acknowledge that acceptance, participation and use of the prize is solely at his/her own risk and therefore must unconditionally and forever release, discharge and agree to hold harmless GardenofAaron.com, Southern Exposure Seed Exchange and any of their officers, directors, employees, agents or contractors from any and all claims, judgments, costs, damages, losses, expenses and liabilities relating to any claim now or hereafter with respect to any death, personal injury, property damage, pecuniary loss or other loss, damage, cost or expenses suffered by winner or any third party as a result of the sweepstakes or the prize awarded. - GardenofAaron.com will have sole judgment and discretion in selecting a winner and awarding the prize. GardenofAaron.com will not be liable for any technical malfunctions or typographical errors that result in the disruption or corruption of the sweepstakes. In the event that tampering, fraud, technical failures or other problems prevent the sweepstakes from running as planned, GardenofAaron.com reserves the right to cancel the sweepstakes or limit entries to those legitimately received before any action was taken and/or award the prize in such a manner as may be deemed fair and equitable by GardenofAaron.com in its sole discretion. - Once winner has fulfilled all conditions and confirmed acceptance of prize, GardenofAaron.com will share the winner's contact information (name and email address) with Southern Exposure Seed Exchange so that winner can claim his/her prize of five (5) seed packets. - In the event that winner does not fulfill all conditions or does not accept prize in writing within 72 hours of notification, winner will forfeit the prize, which will then be re-awarded using a subsequent random drawing. - If you have any questions about these sweepstakes rules, please contact GardenofAaron.com for clarification. - This sweepstakes is void where prohibited by law. What a great interview! I met Ira at the Garden Blogger Fling and she was ever so nice. I was just in my veggie garden planting carrots and beans yesterday-and have plans to plant some more seeds including some Southern Exposure!! I am relieved to hear it is an okay time to plant carrots now as I have been worried I won't have any since I had to dig up the seedlings to plant something else in their spot. I must check out the reemay cover too. Good luck to all in the sweepstakes! Great seeds! Unfortunately we've had a family emergency that has led to A. the garden being completely ignored and B. probably a move to an apartment where I'll have to grow veggies on a porch or balcony. So I have no plans for gardening this autumn yet. I bought my sweet potato slips and ground cherry seeds from them. They both grew very well. They're a great company! I'd love to try growing both of those someday -- and now I know where to buy them!! My ultimate favorite thing to plant has to be snow peas. they are so delicious! My sugar snap peas were some of my favorites this spring. I've been thinking about this today as I've pottered about very happily in my vege garden. And I've decided it's the sheer magic and satisfaction of planting a tiny seed, nurturing it to an edible size...and especially the therapy of getting my hands into the soil! If I'm feeling stressed and have been stuck indoors....to get out and spend some time amongst the fruits trees or vegetable plants is the best therapy ever! In Summer I'm often out there till it's too dark to see any more. Totally agree with you, Mary! I was out puttering until dusk last night myself. Despite the heat lightning and thunder, we didn't get hardly any rain last night, so I needed to quench the plants' thirst myself. I don't have veggie beds ready yet so I won't be planting anything this autumn, but I do hope to get the beds built. The Monticello Heritage Harvest Festival sounds awesome, I hope the weather is good that weekend-if so we'll be there! Are you doing raised beds, Julie? Or do you mean that you're preparing beds through a lasagna gardening method? I've got to say that (surprisingly) I've actually had better luck with plants right in the heavy clay soil than in the raised bed filled with mushroom compost! Incredible! As for fall crops, broccoli and as many different varieties of greens as I can make work. Thanks for the tips too, this may explain why my cilantro didn't make it through the scorching latter half of June! Sounds great. I loved my spring crop of mustard greens, but since I garden organically, they did get eaten up by insects as the season progressed. Are you growing mustard greens this fall? Or do you have suggestions of other greens that do particularly well in the autumn? I'm always looking for new ideas and know I have much to learn from other gardeners such as yourself! I'm planning on asparagus beans, crookneck squash, burpless cucumbers, king richard leek, and anything else I think my wife might love! Thanks for the comment, Brandon. I've never even heard of asparagus beans, but I'm going to look them up now! I hate the early drought this summer as it killed most of my crops (except broccoli, lettuce and some tomatoes...thankfully 9 varieties survived). In the fall, I'm looking to grow acorn squash, spaghetti squash, Romanesque broccoli and greens (in the hot box). Great blog. My friend, Jamie, referred me. Thanks for the compliment, Isaac! Sounds like you had great success with your tomatoes at least. They've been the star of the show in my summer garden too. Which tomato variety has performed best for you this year? Good luck with your fall garden! Thank you for subscribing, Jules. Sounds like you have some big planting plans!! Thanks for subscribing, Diane. Good luck with those bulbs! I subscribed to your emails, and this fall I would like to plant some herbs, roses, broccoli, greens, and squash. Thank you for the lovely giveaway! Thank you for subscribing, Erin. We will plant a variety of greens for sure! Thanks for subscribing. Good luck with your greens. As Ira says in the interview, you can often get better results with greens in the fall since there are usually fewer insect pests around to cause trouble! You still have some time to decide. If you're going to plant perennials, the information I've seen says to try to get them in the ground around six weeks before your average first frost date. i would love to grow some sunflowers or tomatoes!